BIO: These two men couldn't be more opposite but in some ways couldn't be more alike. Dre Drummond is obviously one of the smaller competitors in OTW and originally didn't seem to earn the respect of the OTW Fan Nation. But after adapting a different attitude and truly letting developing into the exciting crazy Dragon, Dre Drummond became a fan favorite. Chris Dace however is known for being one of the larger competitors on the OTW roster and its resident cave man. Having always been appreciated by the OTW Fan Nation for his unorthodox style, Chris Dace helped show Dre Drummond the importance of just being himself. Now these two guys have banded together to form a very unorthodox yet very formidable tag team. 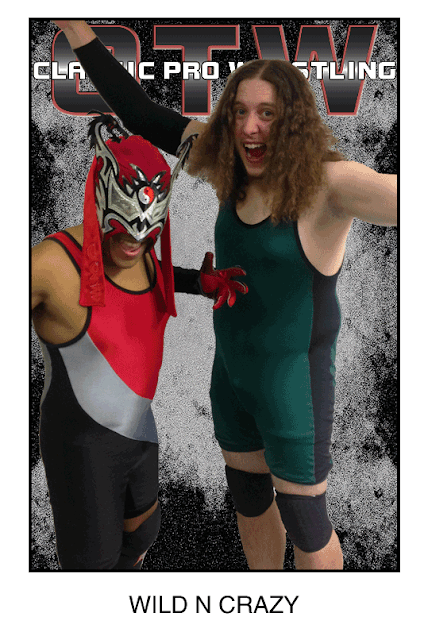 Their ability to confuse their opponents with their different approach to wrestling along with their mix of power and speed gives Wild n Crazy an advantage over the rest of the OTW Tag Division. So when you're at a live show and the HA HA HA HA begins a roaring, hold on to your seat it's going to be a wild … and crazy ride.